Where can I find the resources on bees and other pollinators that Debbie Roos mentioned during her presentation at the Design Institute? At the 9th Annual Natural Learning Design Institute, Debbie Roos, Agricultural Extension Agent, NC Cooperative Extension, Chatham County Center, made a presentation titled Please Design My Garden with Flowers but No Bees about the benefits of bees and other pollinators. Debbie referenced several resources within her website during the presentation. Chatham Mills Pollinator Paradise Demonstration Garden for weekly updates of what is in bloom. List of (mostly native) plants for bee forage (pollen and nectar). Photo gallery of North Carolina pollinators. 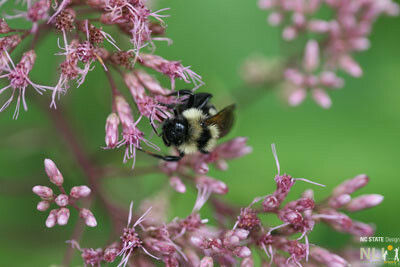 Resource list for pollinator conservation.